Well foodie friends, I hope you had a great Easter weekend full of family, food and of course PEEPS! I had a small serving of each, and even got to witness a super crazy day at the grocery store (note to self: good friday is way crazier than black friday, but with none of the deals). Today, I hit the sale shelves and picked up all the Easter candy of my dreams, for a fraction of the price. My grandfather loves chocolate, so I always buy the holiday stuff on closeout. It's the simple things that make me happy. 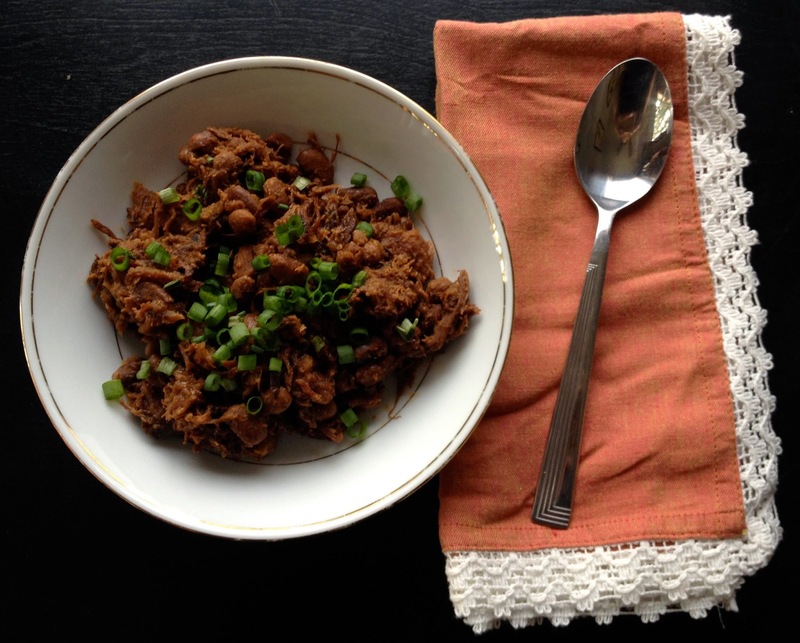 Speaking of simple things, this recipe is super simple, and a great basic recipe to memorize. Have you ever cooked beans from scratch? Please say YES, please. If you haven't don't worry, you will want to when you find out how simple, good and inexpensive they are. I was afraid of cooking beans for years, I'm speaking literally here. When I made chili, I bought canned beans. When I made anything with beans, I bought canned beans. If you have made chili that way, you know that all those cans of beans can really add up. Trust me when I tell you, take the leap, soak and cook the beans yourself and never look back. We make beans all the time, but this recipe reminds me of the holidays. It calls for a meaty ham bone, the best way to come across one of those is to buy a ham, spiral or otherwise, for a holiday dinner or otherwise- this is a pro-ham zone, where you do not have to wait for christmas or easter to enjoy it. Yay ham! Anyway, get your ham, cook it, and reserve the bone with any leftover meat still attached. 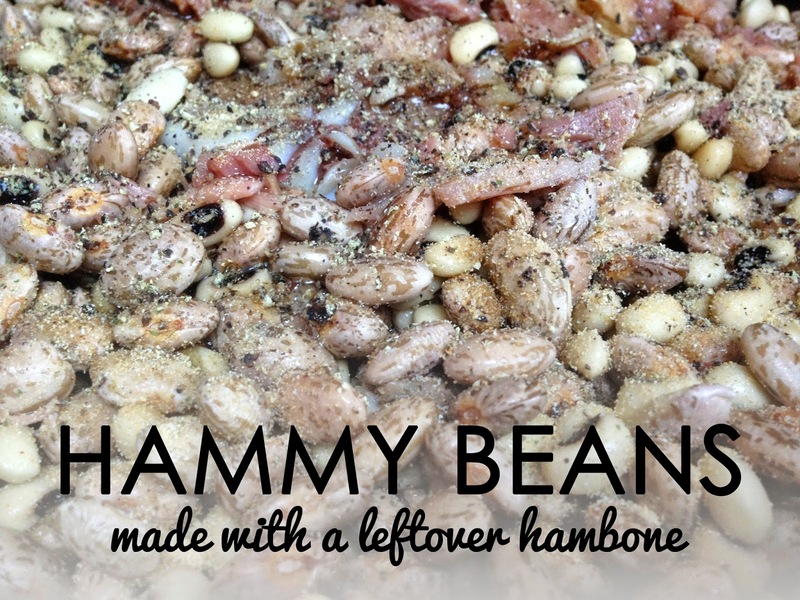 We never throw our ham bones away, if we aren't making beans immediately, throw it into a ziplock and into the freezer it goes. In this case we not only reserved the ham bone and a bunch of extra meat, but we also saved the juices drippings from the bottom of the ham pan, and even the leftover pineapple (my husband loves pineapple with his ham). First you soak the beans, follow the directions on the beans you buy, but the basic idea is that you wash the beans, and sort out rocks and cracked beans the night before, place in large bowl and cover with liquid. Let them soak overnight. The next day, start by putting the onions, garlic, and then the ham chunks in the bottom of a crockpot, mix together. Then fill up the rest of the crock with the soaked beans. Settle in the ham bone and then add enough liquid to cover the beans. Toss the cooked pineapple on top, and arrange it to look like a face. OK, maybe that only looks like a face to me. We use a mixture of water and broth (any kind will do). Then turn that cooker on low for about 8 hours. Stir the beans every couple hours and add water if it starts getting low for the first 4 hours, then stop adding liquid and let them thicken up. The beans are done when tender. Salt to taste and serve! Note: Do not add any salt to the beans until they are done cooking, or the beans will be hard, and not so delicious. Please enjoy your beans responsibly, and open a window.